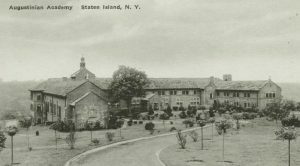 In 2016, the Augustinian friars informed Our Lady of Good Counsel that owing to a dwindling population of clergy they were leaving Staten Island, a location they had served for 117 years. It was in 1899, that the Augustinians agreed to establish a school for boys on the island. The original school was in the vicinity of Austin Place in Tompkinsville. It was named Catholic High School of Richmond Borough. Seeking expansion, ground was broken in 1923, off Howard Avenue on Grymes Hill, for a new school to be named Augustinian Academy. Augustinian Academy welcomed both students and postulants. Hence it was also considered a “minor seminary” that assisted young men to join the order. The population of students was always small. Between 1899 and 1969, when the last class departed, 1,450 students had graduated. Of these graduates, 245 men went on to become Augustinian priests. 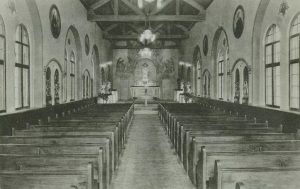 Former chapel at the Augustinian Academy. Much of the information in this post comes from a “Staten Island Advance” commentary by Daniel Leddy that was printed on April 18, 2016. Mr. Leddy noted that the school’s coursework was difficult, so much so that when the men continued their studies after graduation, college seemed easy. He also noted that there was a strong school spirit. That must be why we often see posts on Facebook and elsewhere regarding the school. Today, there is a monument in honor of the Academy at Our Lady of Good Counsel Church. The “Augustinian Academy Hall of Memories” also showcases memorabilia and articles from the school. Yes, the spirit endures. As of 2016 an annual reunion was still being held by students from a school that closed 49 years ago! Hi Pat, Thanks for the link to your books and articles. As I earlier stated, my older sister, Joan McAndrew McEnearney, worked as a “mother’s helper” to the Wright family in New Dorp while a high school student in the late 1940’s to 1950. Dr Wright was a well known Psychiatrist and also practiced hypnosis, and was affiliated with The Staten Island Mental Health Association. So when a physician and his wife were murdered in Clifton, he became involved in the police investigation. I spoke with my sister (who is 86 now, and living in Seattle) last night, and she remembered the incident very well, but was unsure why the victim’s child was considered a suspect, or what eventually became of the child, who would be in his 70’s now. A very interesting case indeed! Hello Carol. Wow have I delayed in responding. I am so sorry. It appears that the young boy took responsibility for the murders, but then it was rescinded. Yes, he is alive today. He did a few interviews with Frank Donnelly of the SI Advance. They were on youtube.com This was about two years ago. I have not looked for them recently. Yes, it was an interesting case, sad, but interesting. Thanks so much for writing Carol.